The zinc-plating is a coating of zinc metal obtained by letting electric current pass through a cell containing an acid solution of zinc salts as an electrolyte (bath). Applications of various products suitable for increasing the corrosion resistance or reducing and keeping the friction constant. Thanks to its electro-chemical characteristic zinc is used as a protection coating on steel parts. The coating effectiveness is guaranteed by the lesser electro-positivity of zinc against steel, therefore we can talk of anodic coating of the base metal. 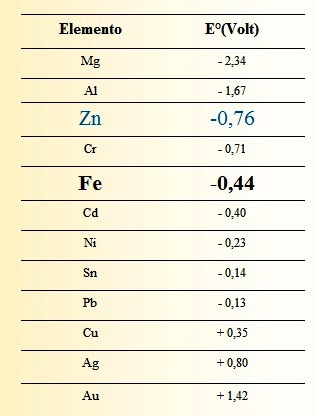 The steel to be coated acts as a cathode, whereas the zinc acts as an anode. By the action of electric current the zinc iones are deposited on the cathode, i.e. the steel. At the same time new “zinc iones” are brought into solution on the anode so that we maintain the same number of zinc iones in the solution. The anode wears in the time and must be replaced. At the end of the electro-plating process of the zinc layer we usually carry out a passivation which increases the yield (resistance) characteristics and provides the required colour to the part.